Physicists explore the characteristics of the world and the universe and refer to them to formulate the laws of nature, the most fundamental descriptions of reality. This makes them universal problem solvers. 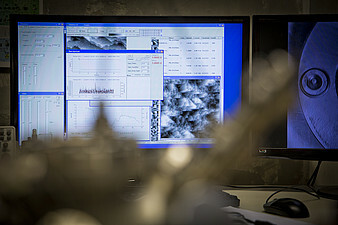 You develop the analytical properties needed to meet key challenges in scientific, economic and industrial fields by working with experimental, theoretical and computer-based methods. In the NAWI Graz master's degree programme Physics, you will build upon knowledge obtained during the bachelor's degree programme and deepen your understanding of an area of expertise in the field of physics as well as familiarise yourself with the latest physical research, especially basic research. You will gain a comprehensive understanding of physics. You will become highly qualified to perform various tasks both in Austria and abroad by completing this research- and application-based programme in an international environment. You deepen and broaden your physical and mathematical knowledge. You familiarise yourself with current physical research. You specialise in an area of expertise in the field of physics. You learn to solve complex problems independently using physical and mathematical methods. You learn to think analytically. You use experimental, theoretical and computer-based physical methods to solve problems. It is possible to individually combine modules from the areas of specialisation with guidance from a mentor.